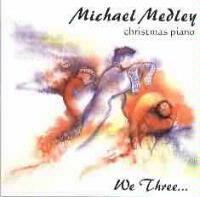 Michael Medley (who although not a household name, has done 5 recordings, including a live video) released this CD of solo piano Christmas songs several years ago. This is a great disc for sitting by the fireplace with someone you love during the holiday season. The disc can be purchased directly from Medley for $14.48 for CD or $10.48 for cassette (both prices include shipping). He can be contacted by email at Zappaq@aol.com, fax (949-249-4379) or snail mail (24852 Wave Crest Lane, Dana Point, CA, 92629. Please mention that you read about it in the Music Street Journal. Medley puts in a very pretty and delicate rendition of this holiday favorite. This is a very beautiful interpretation of a wonderfully beautiful song. Somewhat Wakemanish, this is an intriguing original composition with strong classical leanings. Quite dramatic, this one features a very unusual arrangement. This cut is a greatly pretty arrangement and performance of this classic. A lovely and gentle original composition, this is quite a brief piece that seems to lead directly into the next number. Beginning in an almost playful mode, this quite dramatic piece, with Emersonesque leanings segues into Drummer. A jazzy sort of arrangement of A Little Drummer Boy, this is quite an entertaining cut. A playful and rousing rendition of Santa Claus is Coming to Town, this one calls to mind Keith Emerson. This is a delicate and pretty number. A more sedate, thoughtful and slower tune, this one is quite beautiful. This is a beautiful and enchanting piece with a surprisingly energetic texture. Ring! is definitely a stand out cut. This is a rather intricate and fairly sedate performance. Medley does a fairly playful performance of this piece. Another fun song, this one is quite complex in many ways. This cut is a very pretty variation of a John Lennon Christmas composition. Wakemanesque and quite beautiful, this original number is very wonderfully intricate. A considerably brief piece, this is, nonetheless, quite an effective version of this Christmas classic. A very fun number, again showing inklings of Wakeman leanings, this one includes a playful ending. This Christmas favorite is given a jazzy and playful reworking.